Olive egg colors can vary! Max order quantity of 15. You've been dying for olive eggs in your egg basket, and they're finally here! This new designer breed is producing an assortment of beautiful olive egg layers. 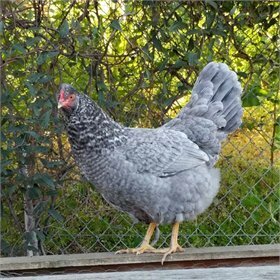 (We're keeping some of our breeding secrets under wraps, but we can say we are using Marans, Legbars, Welsummers, and Ameraucanas in the mix, both F1 and F2!) 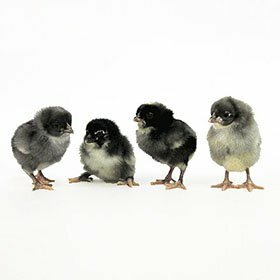 There is no guarantee which of the breeding programs your chicks will originate from, but you will be delighted by the varied color patterns of these chicks. Your chicks may have that adorable chipmunk pattern, or be black with yellow and white spots, or be all blue. 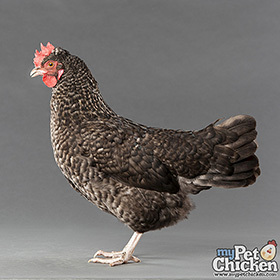 Best of all, the parent stock are friendly, easy-going breeds, so your Olive Egger is likely to be a family favorite! Though the plumage on this cross varies, 95% of our Olive Eggers will lay an olive-shade egg, varying from lighter olive to very dark "army green." For genetics lovers, the reason for that is our flock is a combination of F1s and F2s. F1s have a 1/16th chance of laying a brown egg instead of an olive egg, and F2s have nearly a 100% chance of laying olive eggs. 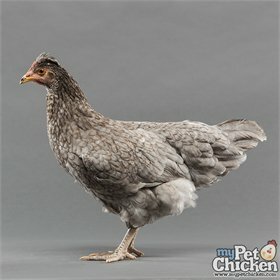 This is one of the rare breed chicken breeds Martha Stewart asked us to deliver to her in 2017 for her own flock! * Any order of 15+ chicks ships via USPS Priority Mail service, and 3-14 chicks ship via USPS Express Mail. * We offer Marek's vaccinations on all standard (large fowl) chicks, and you'll have the opportunity to select that during the checkout process. 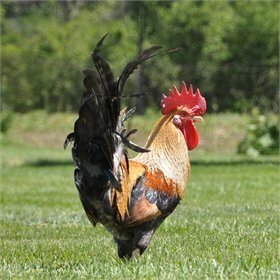 * Breed photos may not be representative of the parent breeding stock.In some cases our photos are of winning exhibition lines of poultry. Unless noted otherwise, we do not source from exhibition lines, nor do we select for exhibition.